Here at Directions EMEA 2013 Microsoft just finished their keynote. Microsoft Dynamics NAV 2013 R2, the next version, was presented. Here are some highlights from this session. Overall: it is (again) a very great and promising release! NAV 2013 R2 is completely integrated with Office 365 and SharePoint online. One login, easy navigate from NAV to SharePoint and back. See NAV data directly from SharePoint and work on it. NAV Web Client can export data to Excel Web App. Micosoft brings the full power of PowerBI to NAV. Installing NAV on Azure is extremely simple. Installing a new virtual machine is a matter of just choosing a name and base image. You can create your own images with NAV preinstalled and use it to create new copies of a NAV environment. NAV 2013 R2 Server is multi tenant, which means that one NAV server instance can serve multiple database. Multiple instance has a limit on user count that it can handle before performance drops. Multi tenant server does not suffer this limit. Windows Server Health Monitoring can monitor NAV server and display issues, including hints to solve them. 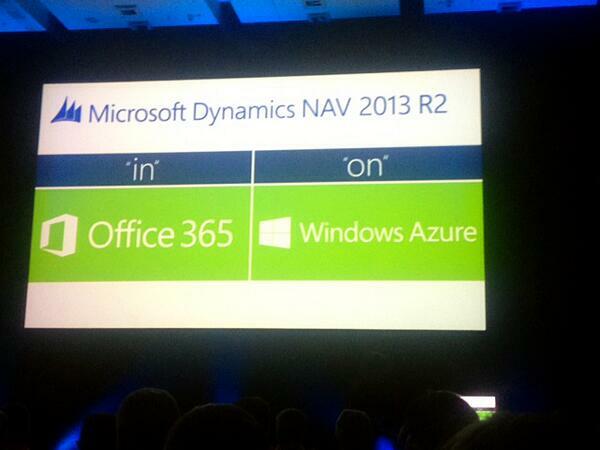 NAV 2013 R2 is to be release on October 31st (if not before…). Release Candidate has been cut last Friday, right now checks on localized functions, installers, etc. is done.